With the 2018 school year winding down, many parents are beginning to prepare their vacation and travel plans for the next school year. 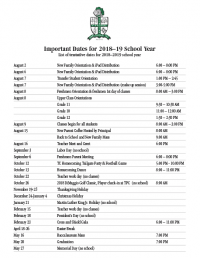 For your convenience, we have compiled this tentative list of calendar dates for the 2018–2019 school year. Please keep in mind this is not the official school calendar and dates may change as we finalize the 2018-2019 school year. During the next several months, the schools website will undergo updates & upgrades including a new web-based calendar. Until these updates are completed the 2018-19 school year will not be shown. Additionally, new parents and current parents will have access to the Rediker Portals Plus upon completing registration for the next school year. Additional events are added and updated throughout the year, so please be sure to subscribe when it becomes available. Notifications will be published as needed over the summer months and again in the e-TC Friday weekly when school begins in August.